Happy Thanksgiving Day eve! OK, I know there really isn’t such a thing. Yesterday I spent my morning baking up some delicious wintery/holidayish scones. Gingerbread and pumpkin. Two of my favorite flavors this time of year. These would be perfect to make this evening to have ready for Thanksgiving breakfast or for Black Friday breakfast. The gingerbread ones are perfectly spicy and the pumpkin ones taste wonderful on their own, but if you want to kick up the sweet factor I will provide the recipe for the icing and maple cinnamon drizzle. Mmmm. Bake up some scones and have a happy and safe Thanksgiving! Both of these scones can be placed in the freezer in an air tight container or zip top bag. 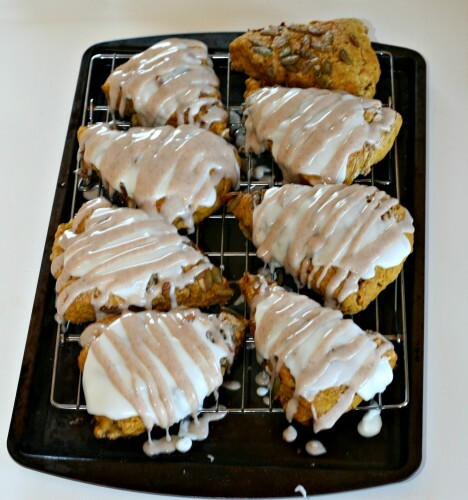 If you are freezing the pumpkin scones wait to add the icing when they thaw out. Combine flour, brown sugar, baking powder, ginger, baking soda, salt and cinnamon. Cut in butter until mixture resembles coarse crumbs; set aside. 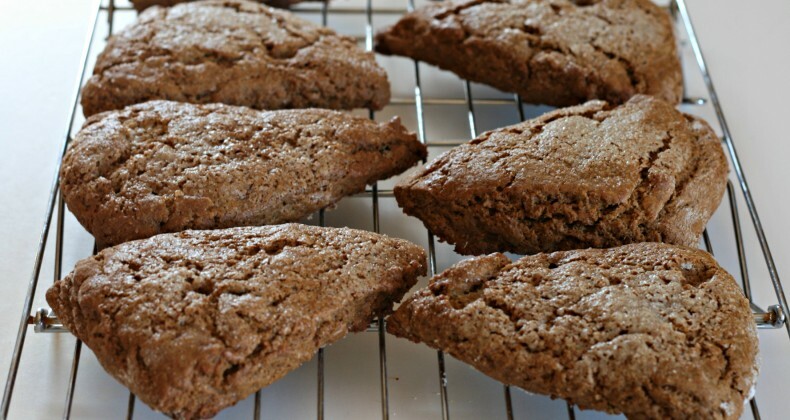 Combine the molasses, milk and egg yolk until smooth; stir into the flour mixture just until moistened. Turn the dough onto a floured surface; knead gently 6-8 times. Pat into an 8 inch circle; cut into 8 wedges and place 1 inch apart on a parchment lined baking sheet. Beat egg white then brush over scones. Sprinkle with sugar. Bake at 400 degrees F for 12-15 minutes or until golden brown. Remove from pan to wire rack to cool. Combine flour, sugar, pumpkin pie spice, baking powder, baking soda in a medium bowl. Grate 1/3 of the butter into the flour mixture on the large holes of a box grater; toss. Repeating grating and tossing twice more. Using fingertips, work butter into flour a bit more. Mix pumpkin puree, sour cream, and egg yolk with a fork until smooth. Using same fork, stir into dry ingredients until large dough clumps form. Use hands to press dough against the bowl into a ball. Place on a lightly floured work surface and pat into a 7 1/2-inch circle, about 3/4-inch thick. Brush with egg white, sprinkle on nuts or seeds, pressing to adhere, and sprinkle with optional sugar. Use a sharp knife to cut into 8 triangles; place on a cookie sheet (preferably silpat- or parchment-lined), about 1 inch apart. Bake until golden, about 15 to 17 minutes. Cool for 5 minutes and serve as is or top with icing. Mix together until smooth. Pour over/spread on scones. Allow to harden for 10-15 minutes before adding the drizzle. Mix together until smooth. Pour into a zip top bag. Cut a tiny bit off the corner of the bag and squeeze the drizzle over top the scones.